This Romantic home is an authentic Log Cabin. It is warm, inviting and features just about every modern luxury imaginable, including a private hot bubbling jetted claw-foot tub; plus, an outdoor Caldera Spa! (See photos). The outdoor Spa is exclusive to and available only for Guests of The Coleman Creek Cabin. It is only a short walk to the Historic town of Julian. 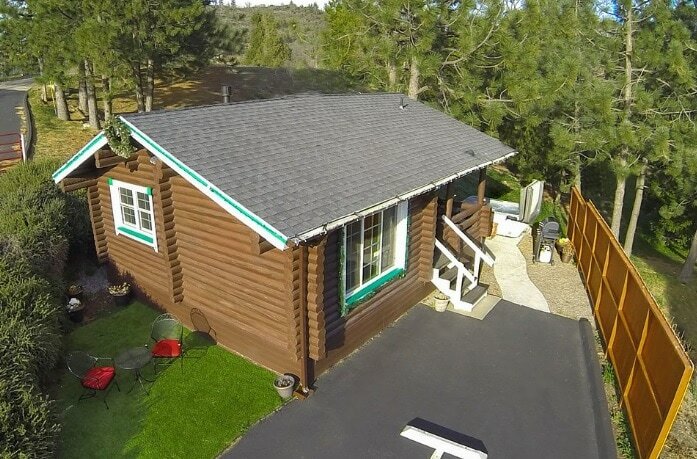 THE COLEMAN CREEK LOG-CABIN is ideally located on a private lane surrounded by trees and spectacular Mountain views. Enjoy an overlook with surrounding forests, nature and wildlife. Exposure to a forest environment has a wonderful relaxing effect. Come experience the enchantment of a real Log-Cabin. A peaceful luxurious environment awaits you as you enter this spectacular mountain home. Enjoy Panoramic views of forest, Mountains and valley. Inside you will discover almost everything is NEW! Cottage includes an all new Queen size memory foam bed. Brand new Kitchen: Oak Cabinets, appliances and Granite counter-tops. Under the stars submerse into our hot bubbly Caldera Spa, Located right off the front porch. Take in beautiful sunsets on the grassy atoll! On cold mountain nights set the thermostat controlled gas burning fireplace (see photo) It will keep you comfy and warm. Home also includes New air conditioning. You can enjoy Dish Satellite TV or watch Blu-Ray and DVD HDTV movies! * Just stroll into town. Located three minutes from Main Street! 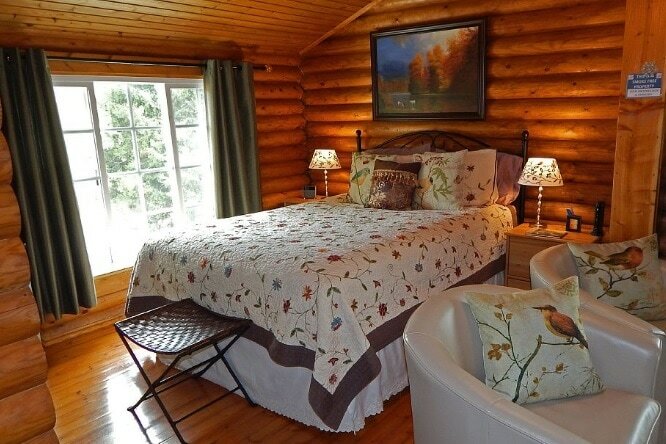 * The Log Cabin is warm, luxurious and inviting. Welcome to The Coleman Creek Cabin! Enjoy clean mountain air, crisp clear night skies. The Cleveland National Forest, Heise State Park, Cuyamaca State Park, shopping, dining, The Smith's Train Ride, Gold mine and museum tours, Hiking, fishing and picnicking at Cuyamaca Lake, horseback riding, The Wolf Preserve, Dudley's Bakery, Wine tasting at over 40 area wineries, night-time stargazing tours (reservations needed). Jess Martin Park offers barbecue pits, picnic tables, playground equipment, a skate-park, baseball fields, a paved walking path (3 laps=1 mile), and a great outdoor fitness center for daily workouts. Experience colorful Daffodils & Lilacs in the spring, star gazing in the summer, apple picking in the fall, or sledding in the winter. Julian Apple Festival in September/October; and, of course... Apple Pie. A FEW HOURS from shopping in Mexico, playing in Disneyland, and visiting the cultural center of Los Angeles and the Palm Springs Desert. At The Coleman Creek Cabin... Enjoy crisp mountain air, forests teaming with wildlife. Where Deer, Hawks, Blue Jays, Woodpeckers, Red Foxes, Silver Foxes, Bobcats, Hummingbirds, Polts, Wild Turkeys, occasional Bald Eagles soaring above, Owls, Orioles, migratory ducks & geese, may be seen nearby or on the property... If you're into wildlife watching and/or photography, this is a great place for both!,. Gentle snowfall in winter months. Brilliant fall colors, cool spring temperatures, summer warmth, and cold mountain spring water! Close to everything in southern California, yet quiet and distant from the noise and traffic jams of the city. Crisp, clear night skies display millions of stars and shooting stars, a family get-away that's great for the kids; or a quiet romantic honeymoon hide-away... The Coleman Creek Cabin. a. Luxurious New Frame less Glass shower. Floor to ceiling mosaic Rock communicates beautiful opulence. e. Reverse Osmosis water dispenser installed for your drinks and tea. f. Not to mention, there is a blender, coffee maker, toaster, tea pot, BBQ set, coffee mugs, silverware, dishes, cutting board, etc. Enjoy beautiful stone and hardwood floors throughout. Provides a convenient thermostat controlled propane heating system. The covered deck offers a bright cool refuge for relaxation and taking in the panoramic views. Discover a small grassy atoll or the outdoor bubbling water, steam and massage jets of the Caldera Spa... Submerse yourself, relax, and let any problems simply melt away. Home provides convenient transportation arrival and departure. Wall mounted HDTV television... New Blu-Ray player... Plays Blu-Ray formats, as well as traditional DVD’s. Our guest travelers may bring their own favorite Blu-Ray Movies. b. The private deck overlooks mature Oak, Pine, and Cedar trees. c. New deck rocking chairs with Bistro table provide comfort, convenience and night-time stargazing through the trees. Your private HORSE-DRAWN CARRIAGE and Driver will arrive to pick you up at THE COLEMAN CREEK CABIN. This is an additional cost. A reservation with carriage company is required prior to your arrival. Come discover the allure this Historic, inviting and Luxurious cottage has to offer. Make The Coleman Creek Cabin your home during your visit to beautiful Julian CA. Thank you. TO MAKE A RESERVATION Simply Click... Book It ! We are looking for mature renters with a respect for this beautiful home and it's environment. You must be at least 25 years of age in order to make a reservation. Otherwise, please contact us prior to making a reservation.